Olfactive Studio – Sample set of four 1.2 ml spray samples for 6 euros or $8, and a Discovery Kit that includes all five fragrances in 4 ml spray vials for 35 euros or $55 shipped worldwide with some exclusions. No shipping to US or Canada. Parfums d’Empire – Discovery set of of all 13 scents in 2ml spray samples for 22 euros shipped worldwide. Histoires des Parfums – Six 2ml sample vials of your choice for 10 euros shipped worldwide (refundable with 120ml bottle purchase). Juliette Has a Gun – Discovery set of nine 2ml vials for 10 euros shipped worldwide with some exclusions (refundable with any purchase within 2 months). Maison Francis Kurkdjian – Your choice of four 2ml spray samples for 12 euros shipped worldwide. Atelier Cologne – Sample set of all 11 fragrances in non-spray vials for $15 or $3 per individual sample. Shipped worldwide. Slumberhouse – Sample suite of four 2ml glass vials for $20 + shipping worldwide. Memo Paris – Two different sample sets of four 2ml samples for 4 euros each + shipping to select countries. No shipping to US or Canada. Keiko Mecheri – Five 2.5 ml spray samples of your choice for $18 shipped in North America, + shipping for International. Illuminum – ‘Haute Perfume’ or ‘Vaporizer’ sample set of sixteen 1.5 ml sample vials for 25 pounds + shipping worldwide. Etat Libre D’Orange – Discovery Coffret of all 27 of their scents in 1.5 ml vials for 49 euros + shipping worldwide (also see escentual.com below who give a voucher with purchase of this set). Individual samples for 3 euros each + shipping. Huitieme Art Parfums – Discovery set of ten 2ml spray samples for 24 euros + vat + shipping to select countries worldwide. Spadaro – 2 ml samples of all three scents for $10 shipped worldwide. Olympic Orchids – Deluxe sample box including twenty 2ml sample vials for $40 shipped in North America. Ysuzac – Samples a la carte: your choice of any six 2ml spray samples for 5 euros each + shipping worldwide. Tauer – Discovery set: your choice of five 1.5 ml spray samples for $32.90 to the US, 31 euros to France, and 25.40 euros shipped to Austria, Germany and Switzerland. Individual samples also available. Neela Vermeire – 2ml samples of all three scents for 22 euros shipped worldwide. Sonoma Scent Studio – Gift set of ten 1ml sample vials for $40 shipped in the US. Heeley – Individual 2 ml samples of any of their nine fragrances for 3 euros each + shipping worldwide. Le Labo – Individual samples for $6 each ($12 for City Exclusives) shipped. Discovery set of three 5ml sprays for $58.00. Carner Barcelona – Individual 2.5 ml spray samples for 5 euros each shipped worldwide. Tallulah Jane Naturals – Three 1.7ml spray samples for $15 shipped worldwide. Osmia Organics – Up to five 1ml dab samples of perfume concentrate or perfume oil for $2 each + shipping to select countries worldwide. PK Perfumes – Discovery set of all twelve fragrances for $25 + shipping worldwide. Czech & Speakle – Sample pack of ten samples for 2.50 pounds + shipping worldwide. 5 pound gift voucher with purchase. Ineke – Deluxe sample collection: Gift box of 1.5ml samples of all 8 perfumes for $25 shipped in North America, fully redeemable against future purchase. Les Nez – Sample set of four 2.5 ml spray samples for $22.40 + VAT shipped worldwide. Smell Bent – Sample pack of five 4ml travel sprays (premium scents 2ml) for $28 + shipping, worldwide. Providence Perfume Company: Sample Coffret Set of ten deluxe sample sprays for $68 + (expensive) shipping worldwide. Individual samples $7 – $12. Penhaligon’s – Scent Library of ten sample vials of their most popular men’s and women’s scents for $25 + shipping. Also available at beautyencounter.com. Ormonde Jayne – Discovery set of twelve 2ml spray samples for 48 pounds shipped worldwide. Sarah Horowitz Parfums – Discovery sets of 1ml vials from $9 – $21.50 plus shipping in North America. Aftelier – Individual 1ml spray samples for $6 each ($15 minimum) + shipping, worldwide. 1000 Flowers – Sample pack of three sample vials for $21 CAD + shipping worldwide. Cognoscenti – Sample set of three 1ml sample vials for $12 + shipping worldwide. 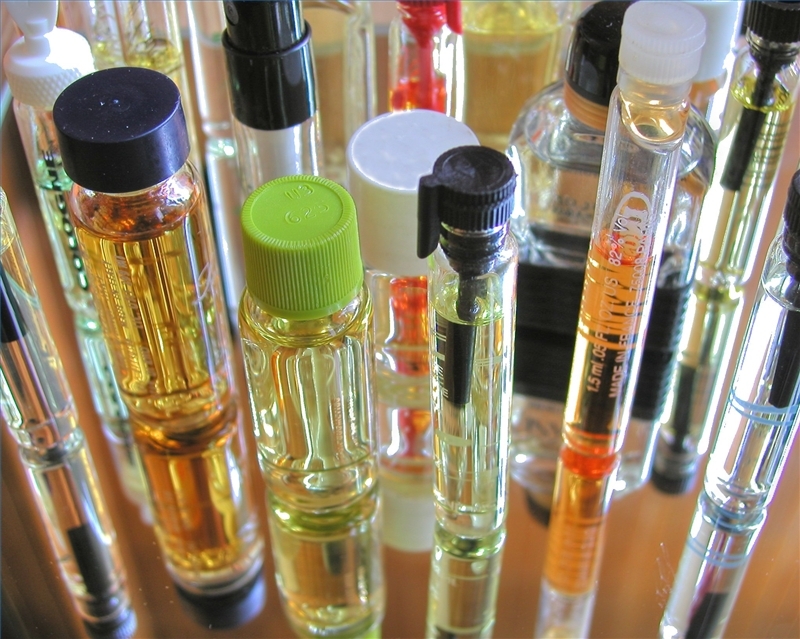 Imaginary Authors – ‘Bookshelf’ of seven 2ml spray samples for $35 + shipping worldwide. Les Parfums de Rosine – Sample set of all fifteen scents in vials for 25 euros shipped worldwide. Lorenzo Villoresi Firenze – Individual 2ml spray samples for 3.40 euros each + shipping to select countries worldwide. Kerosene – (kerosene.bigcartel.com) Sample set of all eight fragrances in 2ml vials for $38 + shipping worldwide. By Killian – ‘Velvet Pouch’ sample set of ten 1.5 spray samples for 25 euros + Vat shipped to select European countries. Set of five samples also available for 15 euros + Vat. Amouage – Boxed sample set of twelve spray samples – women’s or men’s set for 72 euros + shipping. Purdistance – Boxed sample set of four 2ml spray samples for $59 shipped worldwide. Frederic Malle – If you phone the NY store, they will send you three samples of your choice for a handling fee of $20. Robert Piguet – If you email them, they will send you any samples of your choice for $3 each + $15 shipping. Hermes – If you send them a thoughtful email, they will send you any sample you ask for (though I’ve heard they’re more helpful in North America than in Europe). In all these cases, the stores will be most accommodating if you sound like you intend to buy. Keep that in mind when you craft your email/call. theperumeshoppe.com – Prepackaged sample sets of five (vial and spray) samples of these brands: Agonist Sample Set $35, Amouage Sample Set $35, Bois Sample Set $20, Carthusia Sample Set $25, Comptoir Sud Pacifique Sample Set $20, A E Courday Sample Set $25, Etro Sample Set $20, Frapin Sample Set $20, Histoires de Parfums Sample Set $20, Keiko Mecheri Sample Set $25, Lorenzo Villoresi Sample Set $20, L’Artisan Sample Set $20, Montale Sample Set $20, Parfumerie Generale Sample Set $25, Parfums d’Empire Sample Set $25, Phaedon Sample Set $25, Parfums de Nicolai Sample Set $20, Penhaligon’s Sample Set $20, Purdistance individual samples $10, Ramon Monegal Sample Set $30, Serge Lutens Spray Sample Set $25, Yosh Sample Set $20. Or choose five individual 1ml dab samples of any fragrance they carry for $20. All prices include shipping worldwide. ausliebezumduft.de (First in Fragrance) – Lorenzo Villoresi Sample Set of sixteen 1.5 spray samples for 45 euros, Vero Profumo sample set of all three scents in 2ml samples of Eau de Parfum (9 euros) or Extrait de Parfum (11 euros), Puredistance boxed sample coffret of three scents for 25 euros, Amouage boxed sample sets for men and women (six 2ml spray samples) for 45 euros. All prices + shipping worldwide. europerfumes.com – Montale sample sets by theme (Aouds, Roses and Flowers, Woods and Musks etc. ), seven manufacturer vial samples for $10 + shipping worldwide ($10 refunded if you purchase a full bottle). Amouage boxed sample sets for men and women (six 2ml spray samples for $50) and mixed (ten 2ml spray samples for $75) + shipping worldwide. parfum1.com – Discovery Pack of eleven 2ml vial samples of L’Artisan fragrances $45, Discovery Pack of eleven 2ml vial samples of M. Micallef women’s fragrances $49, Discovery Pack of eleven 2ml vial samples of M. Micallef men’s fragrances $47, Amouage sampler of six 2ml spray samples $50 and some individual samples for Slumberhouse, M.Micallef and Mary Greenwell. All + shipping duties and taxes to many international destinations. beautyhabit.com – Sample pack of any three fragrances they carry for $15 shipped in the US. Includes a $10 coupon good towards a full size version of one of the sampled items (coupon expires 60 days after issued). Prepackaged manufacturer’s sample sets of Ineke, Linari, Penhaligon’s and Tocca $15 – $25. All + shipping internationally. luckyscent.com – Individual 0.7 ml samples of practically every fragrance they carry for $3 – $8 depending on the scent, + shipping. They also have these sample sets: Yosh Sample Suite of six 0.7ml dab samples for $30, Decinnal Sample Set of four 1ml sample sprays for $18, Purdistance Sample Set of four 2ml sample sprays in a gift box for $60. All + shipping worldwide. minnewyork.com – Sample Program: Order individual dab samples (probably about 0.7 ml) of practically every fragrance they carry for $5 each shipped worldwide. Also available: Amouage boxed sample set of ten 2ml sample sprays for $75 + (expensive) shipping worldwide. Aedes de Venustas (aedes.com) – Sample Program: Choose any 7 fragrance samples (manufacturers) for $20 inclucing shipping (US only) and get a code for $5 off your next order. b-glowing.com – Fragrance flights of six 1.5 ml mixed niche samples for $18. Comes with a special 20% coupon code towards a full size purchase. Also, individual samples of some of the scents they carry (click on the scent you’re interested in and it will be an option, or not). All + shipping worldwide. escentual.com – Etat Libre d’Orange – Discovery set of twenty-five 1.5ml samples and a poster for 24.95 pounds + shipping (UK only). You also get a voucher for 24.95 pounds toward a full bottle purchase. surrendertochance.com – Vast selection, curated sets, owned and operated by Patty of Perfume Posse. Monthly discounts if you sign up for the newsletter. theperfumedcourt.com – Vast selection, curated sets, once owned and operated by Patty of Perfume Posse. Monthly volume discount codes if you sign up for the newsletter. myperfumesamples.com – Large selection of predominately designer fragrances. Good prices, free shipping over $50 in the US. decantshop.com – a newer site with a smaller selection of niche and designer, good prices and free shipping over $50 to US and Canada, free over $75 international. That’s it, that’s all. I’d love to know if I’ve missed anything. Feel free to follow the blog or share if you found this useful. JoAnne Bassett natural perfumes have samples and sample sets at this link. Exciting! I LOVE scented packages. Expecting a few right now, impatiently. Did you like any of the HdP’s? What a service for us all. Thank you! You’re welcome Ann! Glad its helpful. This is a very useful resource. Thank you so much for sharing! I was thinking about doing exactly this post… probably for a year now 🙂 And exactly the same way: companies that send their samples (because I also appreciate it) and then other resources. Thanks for doing that. It’s too late now but tomorrow I’ll go through my list and see if I have anything to add. That doesn’t surprise me since you’re so good at record keeping and charts! Yes, please let me know what I’ve missed. This is a terrific resource. Thank you! Hi! Sorry for being late to comment, I just found this great post and thought that Maison Francis Kurkdjian in missing on the list. They offer a set of 4 2ml samples for 12 Eur, S&H included. Thanks for the tip! Great deal, I will add that. Lorraine, this is a Godsend! However, I’d like to make an amendment to your original list: Olfactive Studio does not offer the Discovery Set (both 1.2 and 4ml options) to Canadian or US citizens. Or at least not when I went on today. Finally, please add “http://www.decantshop.com” to list of sampling service companies. This relatively new establishment has a smaller selection (mostly mainstream with limited number of niches) than others but many niches are under $10 for a 5ml glass atomizer. This is considerably less than comparable sites. Plus, shipping is free in US and Canada for orders over $50. Adriana provided such exemplary customer service towards an inquiry of mine that I placed an order immediately after her prompt feedback. And that isn’t all. Free sample(s) with EVERY order and I also got a 10% coupon. My order came to only $53 for an 8ml atomizer of Fico di Amalfi (Acqua di Parma) and 15ml of L’Ete en Douce (L’Artisan). I am smellyshrine. Let the fragrance exploring begin! Hi Lorraine.. did you know there is a lovely lady who does decanted perfumes in Australia now. Her website is http://www.scentsamples.com.au/ Thought any Aussies reading your blog might like to buy local when possible 🙂 …great blog too!! Atelier Cologne also sells sample packages. It is a wonderful blog and I got a lot of good addresses! Wow thanks sooo much!!! I’m getting my first niche samples this week so excited. Mentioned this article in my blog post. Thanks Moira! Glad my list helped – loved your post! Wow! I happened upon your blog while searching reviews of Carner Barcelona D600 which I absolutely adore. Great blog and thanks for compiling and sharing your list. I am also in Canada. So nice to hear from other Canadian fragheads 🙂 D600 rocks! Late to the party but Eisenberg Paris will mail you samples for free if you email them at their website. They are like these cardboard spray samples. Good for one time but free nonetheless. Great job compiling all this info. Thank you for sharing! as a perfume lover I already knew about some brands making it easier for you to choose among their creations (Rosine, Juliette has a gun, Penhaligon’s, L’Artisan). However, I found your blog by trying to find a Byredo discovery kit. I’m just dying to try some of their perfumes and I know for sure that they had a discovery kit some years ago that now has dissapeared. I really regret it as I avoid blind-buying.